Note: The row gauge is more important than the stitch gauge in this pattern. If you’re meeting the 6.5 rows/inch, then each 16 row stripe should equal about 2.5 inches. 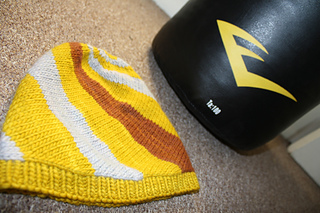 Therefore, 8 stripes equals a hat that is 20” in circumference. For best results, knit a large swatch and block it to check your row gauge. You can then check yourself again after working the first stripe. Measure it at the widest part at the very bottom and multiply the measurement by 8 to get an approximate hat circumference. 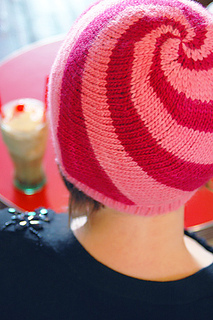 Diagonal knitting combined with easy short-row shaping creates the candy-cane striping effect. The Malabrigo Merino Worsted is so soft you’d swear it was spun from cloud fiber by the knitting gods themselves, and comes in so many delicious kettle-dyed colors you’ll want to make more than just one Lollipop hat. The stripes can easily be customized to accommodate up to eight different colors – a great way to use up remnants for those on a yarn diet.